Before you roll your eyes at one more blogger/influencer person selling you something. Hear me out. Most of you don't know me personally enough to hold your trust, but I can say with utmost confidence, that I believe this product can help people. Some time last year, I started working on a third cookbook. When I got about 40% of the way through, I tried to sell the idea to my publisher. I was working on this project diligently, madly in love with many of the recipes, having them tested, we'd shot about half, and then I got turned down. The cookbook world continues to be a super over saturated market, and with all the different diets these days, it is only becoming more so. They didn't think my book would sell without a strong hook, and I couldn't come up with one that felt true to the way that I cook and eat. We eat a moderate, healthy-ish diet. Sometimes I feed tables full of friends and other nights I attend to picky toddlers. I'm all in with the coconut yogurt and the gluten free baked goods, but I will also sit and watch Queer Eye with a pint of McConnells Peppermint Stick if the spirit leads. I shoot down the middle with these circumstances, and apparently, that doesn't sell. I do not take that personally. That doesn't mean never, but it does mean not right now. I was surprised and disappointed, because that was the trajectory my life had been going the last six years. I blogged, I wrote cookbooks, and honestly have NO clue what my career pivot is from here. So more cookbooks, right? Apparently not. I tell my kids to problem solve. I may have a tendency to do things for them because it's quicker, but in a good parenting head space, my job is to guide them into figuring out how to solve problems on their own. So I took my own advice. Problem solve, Sara. Par it down. Why am I doing this? I like taking care of people. Food is the most natural creative expression in how I can live out that care taking. I want to sit around a table and listen and laugh and cry. There are studies that say the happiest people ever are is around a table, enjoying food with people. How can I push people towards that happy place? I pursue good health in a number of ways, but the community I have nurtured here, is by way of feeding our bodies wholesome foods, lots of fruits and vegetables, foods cooked from scratch, and making things taste good because eating is for pleasure as well as for sustenance. I'm sharing recipes because I want to encourage people to cook and eat with people. 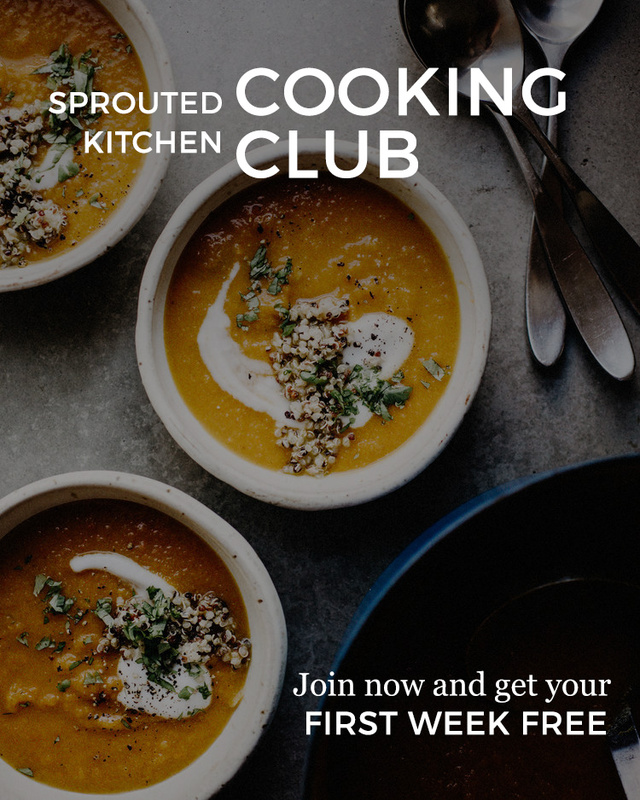 I can do that, perhaps even more acutely and intimately, by way of the program we're creating in Sprouted Kitchen Cooking Club. If your interest is perked, head to this page to read more about what it is. If you're ready to go, you can sign up here. Per request, there will also be a gifting option, which will be available in the shop, so you can purchase the program for a friend or sibling who may enjoy cooking along with you. This is not designed for the super competent cook, these will be simple, straight forward meals intended to spice up and simplify the dinner process. I know we all have different tastes and preferences, but I am hoping this will be a really neat community where we can share ideas about what we changed or did with the leftover dressing, etc. One way or another, it is worth expressing my gratitude to you all, who have been fans and supporters of Sprouted Kitchen in all its forms, and given me the confidence that I have something valuable to share. There is nothing that humbles me more than your kind notes or seeing your pictures of my food in your kitchens. Sign up! Let's make dinner together.